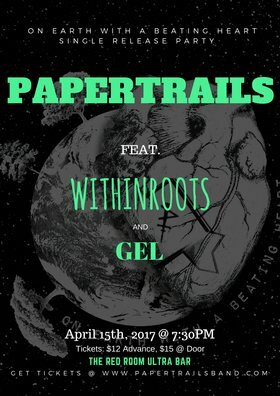 PaperTrails has been in hiding for the last year. Focusing on improving their live performance act and dedicating their passion towards creating music that brings out their true colors. With a powerful Blues Funk Rock style, the band wishes to kick off this upcoming release with a bang. The single (To be Released this night) On Earth With a Beating Heart is a powerful message about the music industry and resilience of the musician's spirit. Passion, drive, integrity and persistence; these are the qualities of the modern musician who has what it takes to make it in the industry. Paper Trails hopes to instill their listeners with the same inspiration they have for music and making it a life long career. Recently the band has focused on expanding their fan base through out Canada. Last summer they kicked off a Canadian tour. This tour allowed them to meet artists all over the country and help friendships grow throughtout the music industry. Music isn't supposed to be focused on what style is better and who is better. It's made to release our inner spirits and help support eachother in the fight for making careers out of our dreams. Inviting to the Red Room on April 15th we bring Withinroots and Gel. Former members of Community Trees who have split off into their own seperate groups to bring out their own personal styles and vibes on people leaving listeners wanting more. Withinroots' performance is very personal and allows for the audience to feel engaged and a part of the show. From the first song to last, Withinroots leaves your feet moving consistently, only to have you asking for more. Gel can pick up a guitar and from first strum you get sucked right into the electric energy of her tunes. With a voice so soothing, you will find it next to impossible to walk away from this performance. PaperTrails is in honour to share the stage with these unbelievable acts. That being said, we would like to do a shout out to Producer Pherbie Midgley. As a Music producer, Pherbie helped make the tune be a part of the band, isolating all the needs from the wants to create a song that just fits perfectly. The talent PaperTrails got to work with only makes the release that much more exciting. Lot's of love to all the people who brought this to life. On April 15th, we will give you everything we can to return the favor. See everyone at The Red Room Ultra Bar!